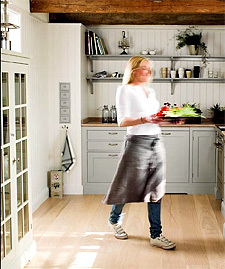 I've had a passion, far more than an interest, in Scandinavian kitchen design for many years. It first relates to my strongly held Danish heritage, my parents having left Copenhagen for the U.S., and me, returning often to visit my family in Denmark, since I was a child. There is a history here. My trips continue periodically. I have felt for some time that we, in the U.S., are more than ready to embrace the wonderful Scandinavian kitchen and interior design "look". As we move away from a heavier, traditional, point of view in the kitchen toward lighter, simpler, looks, with cleaner lines, the recent interest in Asian design makes sense, and Scandinavian design (far less "known") makes sense to be noticed as well, for reasons anchored in, well, hundreds and hundreds of years past, bringing relevance in a perfect way, to today. the broad use of white - as the sun sets so early in the winter months, one needs light! I can tell you that when I was just in Norway in early December, dawn was after 9 am and sunset was at 3 pm, with the sun low in the sky all day, and that was nearly 2 weeks prior to the winter solstice! We walked in town in complete darkness at 3:30 pm. I believe white, or light colors, are nearly a necessity to preserve as much reflected light as possible. the use of color - Scandinavians really love punches of color, whether the color is pastel or bright colors. Often found in contemporary artwork, textiles, and accessories, color plays an important part in keeping away the winter blues. use of natural materials - whether it is light, natural woods, timbers, or other natural materials to remind one of nature and the outdoors. A strong appreciation for texture. clean lines to enlarge small spaces, which most are, in comparison to Americans' generally larger homes. Also, the use of clean lines as part of the Scandinavian design philosophy of an object having beauty in its own simplicity and singular function. A human centered design philosophy. Truly, "form follows function". often, a personal link to the past in regard to beautiful materials and accessories, sometimes encompassing a whole country Scandinavian look of years past. The Scandinavians invented eclectic design! With as much of a strong look to the future, they are masters at combining old, rough, textures with sleek, new surfaces. It is an art to combine the two, and the world must see how the Scandinavians do it so well and so logically. Of course, when you have a kitchen in an 800 year old apartment building with exposed beams and walls, the contrast in new and old materials speak for themselves! I was very excited as I perused the internet on my laptop to see "The Kitchen Designer" site on this great blog, mikkelinesin! What a surprise! There are some lovely shabby chic, colorful, pieces shown, and the blog is very charming overall with lots of white, natural woods, and color. Another good Scandinavian blog is Guldkant Pa Livet with beautiful images of a lovely Scandinavian lifestyle. The top three images come from this blog. The top blue kitchen is the blog author's own kitchen. The house is from 1750 and the oven is probably from the same period. The white oven image is from the north of Sweden and dates from 1890. 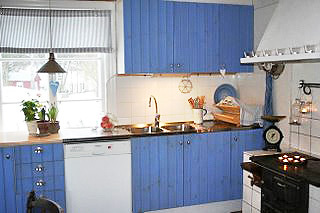 The middle lighter blue kitchen images come from the Kvanum kitchen company. This is but a very small sampling of Scandinavian kitchens I will be showing you. Every Monday will now be "Scandinavian Kitchens Monday"! Don't miss it. I would love for those who live in Scandinavian countries to talk more about what makes their kitchens wonderful. Please add more information to enlighten us all! Just to put this over the top, please visit this blog, Red House, authored by a Swedish designer living in the U.S. You can get lost in all the wonderful images. Scandinavian Kitchens? You heard it here first. The beautiful image below is from the Norway's beautiful interior design magazine, Bonytt. Enjoy!